Wow!!!!!! Two months has passed since my last party report from Miami’s WMC. Memorial Day weekend turned out to be one of the best experiences in my life. i have to thank Armin van Buuren, Ali “Dubfire” and Sharam (Deep Dish duo DJs from Washington D.C.) and Tiesto for an unbelievable time. And, of course, my friends, who came down to Las Vegas from different parts of the US for this remarkable weekend. At first, I planned to spend a Memorial Day weekend in San Francisco and catch Armin’s set there, but as soon as I found out that Tiesto and Armin would perform on the same weekend at Club Ice, I had no other options, but to head for LAS VEGAS. I had hard time getting myself together after a wild night out at Crobar the day prior. My friends kept calling, trying to confirm arrivals and details for the next couple of days. 3 people were coming from Los Angeles, 5 more from Montreal and I, from NYC, plus we were going to meet up with some other people in Las Vegas. I caught a 1.45 pm flight to Vegas and landed at 4.15 pm UTC (which is 7.15 pm EST, ask me why I dislike going to West coast?!). Temperature outside was + 44 C (110 F) (another reason to avoid Las Vegas in summer). My friends from Los Angeles arrived just a few minutes earlier, so we all met up at the airport. Four of us decided not to stay at the hotel, but to rent a 4-bedroom house with a pool just 10 mins away from Club Ice. It was more expensive, but it was worth it as we all fell in love with this place right away. We (my friends, to be precise, because I don’t drink) got drinks by the pool and started getting ready for Ice. Honestly, we all came out for Tiesto, however, that night, Armin van Buuren was the “plat du jour” at Ice!!!! We arrived to the club at 11 pm. None of us had tickets, because we thought it wouldn’t get busy before midnight. We were right and after paying a whooping $60 per ticket, we were in. We have decided to save some energy for the Armin’s set, but Faarsheed, an opening DJ, was just incredible. After about 15 mins, everybody was asking each other if we knew who he was. I can’t remember anybody, who would played such a good warm up (maybe Jon O’Bir for PvD last NYE at Ikon in NYC). I went to find out his name and he gave me his CD (I’m on the plane right now listening to it). He is a resident DJ at Ice and is talented as devil himself. I was really impressed to find such a gem in a desert. Armin went on at 2.30 am and the club blew up. I should mention that Ice is a pretty small venue, it barely accommodates 900 people in a main room and, perhaps, additional 500-600 in a side room. I was surprised to find myself in such an intimate setting, which was the opposite to what I am used to in NYC – mega clubs with 5000 people on an average weekend night. I have to add, that the name of the club came from the mechanism, which periodically released liquid nitrogen from its ceiling, freezing everything and everybody on its way. At first, I panicked because it made it impossible to breath, it was absolutely horrible. I can’t quite describe the feeling, but people who ever visited Club Ice would understand what I’m talking about. The club got pretty packed, so it was about time to move to a DJ Booth. It was so nice to see Armin dancing and having a good time. He never manages to disappoint his fans. I can just repeat what I said last time “I liked every single track he spun”. He was mellower in the beginning, spinning soft tracks with some lyrics but then his set got trance-ier and dance-ier. I had to take my shoes off and dance barefoot, but what a great time I had!!!! I love Armin, his attitude and his attention to everybody. And miraculously, he always picks the songs I like! It was simply amazing!!!! Thank you, Armin! We left Ice at 7.15 am, tired but elated (and 2 kg lighter). Some of my friends have never seen Armin before and they were impressed beyond believe. Indeed, there is something about him that makes everybody go crazy. We got home and everybody went to sleep. I was too over-hyped to fall asleep though, I knew, I had to get some rest before going out to see Deep Dish and Tiesto. Day by the pool passed fast and because we all got the e-mail from Ice, recommending us to show up earlier, we decided to follow their advice and get to the club by 11 pm. When we showed up, the club was barely full. It was a surprise, but an easy explainable one: I paid for my pre-sale ticket $80, at the door it went for $150. Incredible! That was the most ridiculous thing I’ve seen in a long time. I thought $60 for Armin was a very bad deal, but $150 for Deep Dish and Tiesto was pure insanity. Oh well, we got in with our pre-sale tickets at 10 pm. Dean Coleman was spinning a warm-up for Deep Dish and Ali “Dubfire” didn’t make us wait for very long. He started at 12.30 am and Sharam continued after 1.45 am. These guys rocked. 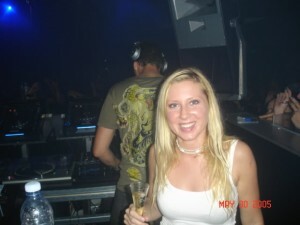 Even though people were there for Tiesto – everybody had a blast! What do you think were the highlights of the night? “Say Hello” and some wicked version of “Flashdance“. Yes! I thought people would break a DJ booth in excitement. Tiesto came on at 3.30 am. I happened to step out but when I came back, people were storming a DJ booth from every direction. I barely got back in. OMG. I don’t have to say how happy I was to see Tijs again. When he saw me his signature smile appeared on his face. Honestly, I think it was the best Tiesto’s set I have ever heard. He wasn’t too soft and wasn’t too banging either. It was as trancey as it could possibly be. And that was exactly what I wanted to hear. I never saw Tijs so happy, he was “crashing and smashing” everything inside of the booth. After 4.30 am people started to leave and it was so nice to finally leave a booth and go to the main floor to dance. He definitely had the time of his life and so did the crowd. And then came…. “Flight 643“. Some time ago, I asked Tiesto to attend my funeral and play this track for me, as it was and still is my favorite tune of all times. Needless to say, I danced like there was no tomorrow. This was the only track I ever wanted to hear Tiesto play life and by then, lost all hopes. Tiesto was supposed to play a 3-hour set but he kept on going, finishing at 8.15 am. He went for almost 5 hours! It was sick!!!!!!!!!!!!!!!! Damn… now i can finally go to bed…. Club Ice videos: part 1 and part 2. This entry was posted in United States of America and tagged Armin van Buuren, DeanColeman, DeepDish, EDM, Faarsheed, Flight643, Ice Club, JonO'Bir, Las Vegas, Music, SayHello, Tiesto, Trance. Bookmark the permalink.